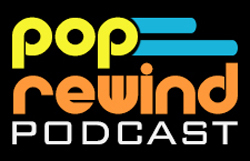 It’s been a bit quiet here at Pop Rewind the last couple months, but we’re changing that soon! We’ve had yet another fun year reminiscing in the weird nostalgia you’ve come to know us for and we’ve had even more fun interacting with you guys. We drank beverages long believed to be dead, interviewed Weird Paul, Lee rode the Oscar Mayer Wienermobile, we put out more podcasts, hung out with the Why Are You Listening to This? Podcast guys, served as judges for Retro Daze, collaborated with Rediscover the 80s, and so much more! Be sure to follow us on Instagram, Twitter, and Facebook. And probably other places. But those are the main ones. In An Alternate Universe, Back to the Future Isn’t Lee’s Favorite Movie: It’s Linz’s Favorite Movie. Are you still with us here? It’s because Corey Hart was offered an opportunity to audition for the role of Marty McFly. WAIT WHAT. Yeah, exactly. Rockin’ Songs for the One You Love. Ah, love. Your music is a snore, but Lee found some truly great hits to help you profess your feelings. 10 Even More ’80s-Themed Valentines We’d Like to Receive. Of course we had to collaborate with our pal at Rediscover the 80s on our annual 80s Valentines feature! Check out our #80sValentines! Pop Rewind Podcast: Event Horizon Deep Thoughts. Lee knows exactly how to pull Linz down a rabbit hole with him: find a tie to lost media. Here, we talk way too much about a film that people actually watched in 1997. Super Mario Maker: E.T. For Atari Style? Hey, remember when we all played Mario Maker? We miss those times. Making themed levels with music became our forte. Beyond Ecto Cooler: Hi-C Teamed Up with NKOTB?! Yeah, yeah, we know. Hi-C = Ecto Cooler. But it also equaled the New Kids on the Block in this shameless advertisement/comic book from Harvey Comics. “Weird Al” Yankovic: Mediocre Rarities? It’s no secret that we’re huge Weird Al fans around here. When the track list from his “rare” CD that was released as part of his giant box set surfaced, we were both underwhelmed. We came up with a much better list, no shade. Beyond Sonic 3: Did Michael Jackson Write the Music for ANOTHER Sega Genesis Video Game? Our annual April Fools article fooled no one, but doing more video work was fun for us. And it’s a pretty ridiculous and fun video, if we do say so. Weird Paul: Working for Views and Recalling Peanut Butter. We were psyched to interview the great Weird Paul! Definitely check this out! Cereal Origin Stories Hollywood Style. This is one of those collab articles we take pride in but that no one cares about. Clearly Canadian Returns! Read the harrowing tale of Linz spending way too much money pre-ordering fizzy sugar water years in advance… just to have Lee find it in stores a good year before her order showed up. Make Your Own Orbitz: The Drink with BALLS. Linz did the unthinkable: recreated Orbitz. Sort of. Update on the aftermath: the dyed chia seeds used for the floating balls really did a number on her strainer. We were getting pink pasta for a while. Pop Rewind Podcast: Riding the Wienermobile. Acting on his obsession of the day, Lee emailed the Wienermobile people and was offered a ride. This is the true story of the adventures of ChiLee and Lil’ Lindsey Linkz. RetroDaze Fifth Annual Article Writing Contest. We were happy once again to serve as judges for RetroDaze. Congratulations to Wes Allen on his winning article Russell – The Black-Eyed Simpson and to runner-up Radical with Oh Pooter! All the entries were amazing and we were excited to read them all! Pop Shoppe Memories, because we love our resurrected beverages. Pop Rewind Podcast: Zombie Beverages. The last couple years have seen the return of many beverages long believed to be dead. Top Picks from the 2017 Button Draft. Rich and Josh from the Why Are You Listening to This? Podcast visited Linz as part of their 2017 tour. Thrifting took place, of course, and the three of them left with a ton of 80s buttons (with some great McDonald’s ones). Pop Rewind Podcast: Sonic Mania Mania. Oh yeah, we were geeked about Sonic Mania and we’re still geeked about it. What a fantastic game. Rick Springfield is a Vampire. We did the research and stand by our findings. E.T. Cookies that Poop Reese’s Pieces (because E.T. is technically a Halloween movie… so… there). Pop Rewind Podcast: Scary Books and Stuff, where we discuss Goosebumps and Fear Street, including a Weird Al-R.L. Stine connection. We hope you had a great year! We’re looking forward to an even better 2018, so stay tuned. Thanks for all your support!